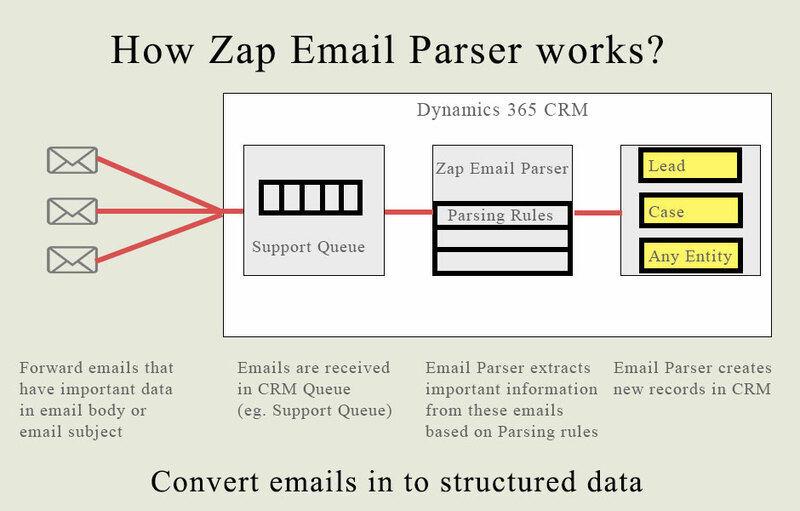 /Zap Email Parser /Getting Started – How Zap Email Parser works? Zap Email Parser extracts the information from emails to create CRM records. The information to be extracted and the destination fields in CRM record are specified using parsing rules. The configuration record also specifes the Queue to which emails will be sent as well as any email subject filter that needs to be applied. For example: you can create 2 configuration records for the same queue (support@yourcompany.com) and have keywords @lead and @case specified in each of configuration.